Mar 29, 2017 • A team of economists from the USGS Fort Collins Science Center has published a new report on Landsat’s use for agriculture. The use of Landsat satellite imagery for global agricultural monitoring began almost immediately after the launch of Landsat 1 in 1972, making agricultural monitoring one of the longest-standing operational applications for the Landsat program. More recently, Landsat imagery has been used in domestic agricultural applications as an input for field-level production management. The enactment of the U.S. Geological Survey’s free and open data policy in 2008 and the launch of Landsat 8 in 2013 have both influenced agricultural applications. This report presents two primary sets of case studies on the applications and benefits of Landsat imagery use in agriculture. The first set examines several operational applications within the U.S. Department of Agriculture (USDA) and the second focuses on private sector applications for agronomic management. Estimating Crop Production.—Provides an overview of how Landsat satellite imagery is used to estimate crop production, including the spectral bands most frequently utilized in this application. Monitoring Consumptive Water Use.—Highlights the role of Landsat imagery in monitoring consumptive water use for agricultural production. Globally, a significant amount of agricultural production relies on irrigation, so monitoring water resources is a critical component of agricultural monitoring. National Agricultural Statistics Service—Cropland Data Layer.—Highlights the use of Landsat imagery in developing the annual Cropland Data Layer, a crop-specific land cover classification product that provides information on more than 100 crop categories grown in the United States. Foreign Agricultural Service—Global Agricultural Monitoring.—Highlights Landsat’s role in monitoring global agricultural production. The USDA has been using Landsat imagery to monitor global agricultural production since the launch of Landsat 1 in 1972. Landsat imagery provides objective, global input for a number of USDA agricultural programs and plays an important role in economic and food security forecasting. U.S. Department of Agriculture—Satellite Imagery Archive.—Highlights a number of the experiences of the USDA in acquiring, sharing, and managing moderate resolution imagery to support the diversity of USDA operational programs. Field-Level Management.—Provides an introduction to what field-level production management is and how it can be applied to agricultural management. This section explores the concept of zone mapping and how Landsat imagery can be used to identify different conditions within a field. The section also provides a case study of zone-mapping software, developed by GK Technology, Inc., that is used by numerous agricultural consultants. Putting Zone Maps to Work.—Highlights several case studies of private agricultural consultants who have been using Landsat imagery to develop zone maps for farmers. Landsat imagery is helping consultants and farmers optimize agricultural inputs, including fertilizer and seed, which leads to higher yield and economic return for the farmer. Increasing Yield.—Highlights the primary benefit of zone mapping using Landsat imagery. Using 5-year market average prices for a number of commodities, this section provides examples of how yield increases translate into higher returns for farmers. 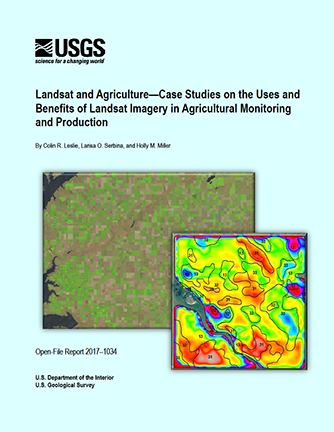 Leslie, C.R., Serbina, L.O., and Miller, H.M., 2017, Landsat and agriculture—Case studies on the uses and benefits of Landsat imagery in agricultural monitoring and production: U.S. Geological Survey Open-File Report 2017–1034, 27 p., https://doi.org/10.3133/ofr20171034. This entry is filed under Agriculture, Landsat Value, News.